The AVS-100 vortex layer device is used successfully in food production to make mayonnaise and various sauces. Using the AVS reduces the complexity of the technology process and its duration, while improving the product’s dispersion. The device intensifies the process by eliminating some of the stages and reducing the cost of the product, improving its taste, stability and consistency, as well as biological stability. 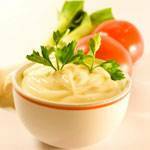 Using the AVS for production of mayonnaise and sauces also improves product shelf life and allows to produce medium and high nutrition value mayonnaise. The technology of using electromagnetic devices with ferromagnetic particles is in constant development, making a better product in compliance with all standards and regulations in effect. For instance, the latest developments suggest the following AVS mode: EM field strength — 15·104 А/m, frequency – 50 Hz, magnetic field induction – 0,13 Tl, vegetable oil input rate 0.0012 l/sec to 0.007 l/sec. A range of ferromagnetic particles with various length to diameter ratio is recommended, including 1:6, 1:9 and 1:10. The described method is patented by Kaplina and Polozhyshnikova (Poltava Consumer Cooperation University, Ukraine). To product mayonnaise using the AVS, the following formulation is suggested. The components of the recipe are sieved (sugar, salt, egg and mustard powders) and portioned into the mixer to make mayonnaise paste (excluding sugar and salt). Then the paste is taken into the chamber of the AVS-100 unit, where salt and sugar are added from loading hoppers. To mix the components, the product is processed for 5 seconds. Half of the recipe’s amount of vegetable oil is added at 0.0012 m/sec, then the other half is added at 0.007 m/sec. The product is processed until mayonnaise is produced, and 5 seconds before completion, vinegar solution is added. The finished mayonnaise is pumped from the chamber for packaging. The result of the processing of the formulation’s components in the vortex layer of ferromagnetic elements is the influence of several factors, such as the frequency and strength of particle collisions. These factors are defining for creation of various degrees of hydrodynamic instability in the cortex layer, leading to dispersion of droplets due to turbulent agitation and crushing of droplets between the colliding particles and due to acoustic vibrations in the medium.